This video of Mitt Romney flipping out on a Des Moines radio host in 2007 has gone viral-ish. 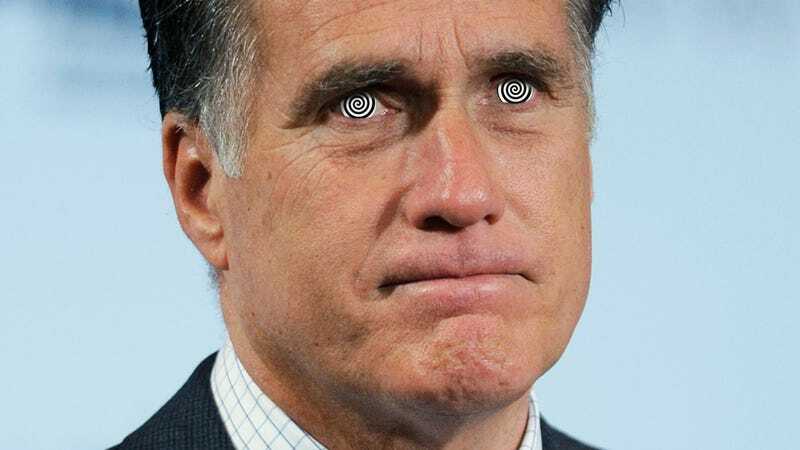 While Romney's insistence on a set of beliefs that many Americans (who believe in just as strange, albeit more popular things) would interpret as bizarre is unsettling, what's strangest about the video is how this 2007 version of MittBot, this guy who insists that his personal beliefs don't mandate that he move to legally limit the rights of others, is so completely unrecognizable in 2012. Did Mitt Romney brainwash himself? Shortly after the point in the video when Romney insists that the Mormon Church believes that Jesus will rise again and rule the world from both Missouri and Jerusalem for 1,000 years, he begins discussing abortion. Romney, who as a Senate candidate was pro-choice, who as Massachusetts governor was pro-choice, is suddenly, uh, both pro choice and pro life. Tepidly. The church does not say that a member of our church has to be opposed to allowing choice in society. … It says, "Look, we are vehemently opposed to abortion ourselves, and for ourselves. But we allow other people to make their own choice." I disagree with that view. Politically, I looked at it. I said, "You know what? That's wrong." And it's not a Mormon thing. It's a secular position to say ... we should have as a society a prohibition on abortion in the following circumstances. But it's not violating my faith. Watching the video, I'm chagrined that I missed it in my review of Romney's abortion record. It illuminates the degree to which Romney, by 2007, had convinced himself of the edited version of his abortion conversion. At the same time, it shows how clearly he continued to distinguish between morality and the law. It doesn't resolve whether he's really pro-life or pro-choice. It simply adds to the evidence that emotionally and intellectually, he's both. Mitt Romney, like Julia Roberts in Pretty Woman, is a total whore for your votes. He'll be whatever you want him to be, but first he'll put them through the complicated faith rationalization machine in his CPU. WON'T YOU BE HIS RICHARD GERE, AMERICA? He'll sing in the bathtub for you! He'll shop at fancy stores and wear streaky 80's blush. He'll pretend he's very serious about things like eliminating FEMA, and then he'll pretend like he's not. Saletan laments all of the memories we'll never have with the Mitt we never knew. Oh, Mitt. Why did you work so hard to hide this? Why did you dress up as a series of characters-the earnest reformer, the capitalist savior, the devout conservative, the bipartisan healer? They all looked fake. They were fake. You were fake. And you did it because you thought we wanted it. You thought we'd love you. We would have liked you more if you'd just been yourself. Romney defending himself and his faith against a guy who doesn't know what he's talking about is not the takeaway here. It's that Romney's public persona is the sum of a million opinion polls and advisors. This cranky guy correcting a radio host about Mormonism is the last shred of "him" left. But at least we know that one Romney belief isn't on the negotiating table: his undying disdain for The Gays. And his hair. That's definitely not a wig.